NBD presents a remote resource as local resource to the client. Also, NBD driver makes a remote resource look like a local device in Linux, allowing a cheap and safe real-time mirror to be constructed. You can also use remote machine storage area as local machine swap area using NBD. To setup the NBD based file system, we need a nbd-server (on remote machine, where we like to access/create the content) and nbd-client (on local machine, where we like to access the remote storage device locally). If you working on Debian flavor, get the nbd-server through apt-get. Create a file using dd as shown below. Use mke2fs to make the /mnt/dhini as a filesystem. When you try to make /mnt/dhini as ext2 file system, you may get a warning message as show below. Press y to continue. /mnt/dhini is not a block special device. You can also run the nbd-server on multiple ports as shown below. Perform the following steps in the client machine, where you like to access the remote storage device. If you working on debian flavor, get the nbd-client through apt-get. /mnt/dhini: Superblock last write time is in the future. FIXED. /mnt/dhini has gone 49710 days without being checked, check forced. Once it gets to 100%, you will get the block device on your local macine on the same path. If you face any issues during the NBD configuration process, you may also configure the nbd-server and nbd-client through dpkg-reconfigure. Once mounted, you may get the directory with “lost+found”. You can start accessing the files and directories properly from this point. When you list the /client_changes, You will get all the client created files and directories properly. 1. What is PoE – Power Over Ethernet? Power over Ethernet (PoE) does exactly what it says — it carries power over ethernet cables. 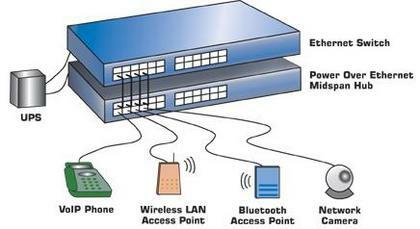 So, an ethernet cables caries both data and current together to operate devices like wi-fi access points. This is very helpful to install wi-fi access points in ceilings, where it is hard to find power outlets. Only smaller devices can be powered using the PoE, as it carries limited power over the ethernet. 2. How does PoE works? 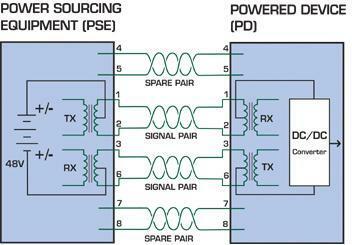 PD – Powered Devices: PDs are end devices that can accept the power transmitted over Ethernet Cat-5 cable. PSE – Power Source Equipment: PSEs add power to the ethernet cable. Midspan device: These are power injectors that stands between the standard ethernet switch and the end device. Endspan devices (PoE Switches): These are Ethernet Switches that includes the circuit to inject power to the ethernet cable. 2 pairs are spare and not used. 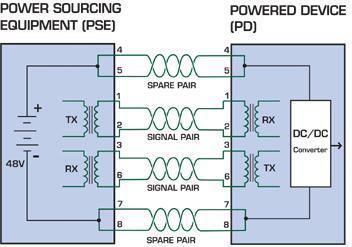 There are two approaches to transfer power over ethernet. The same 2 pairs used for data transfer, is used to carry power. The PSE injects power to the 2 data pairs (pin 1,2 and pin 3,6) via the center tap of the transformers without affecting the data transfer. The 2 spare pairs that are not used, is used to carry power. It applies +ve voltage to pins 4 and 5 of ethernet cable. It applies -ve voltage to pins 7 and 8. 3. What are the Benefits of PoE? Portability: Install end-devices where it is hard to get power. For example, you can install a wireless access point in the ceiling, where you cannot find power outlet. Cost Savings: For a large scale deployment of wireless access point, you don’t need to install power outlet for the access points, which can be a huge cost saving. Simplicity: You need to run only ethernet cable to the end devices, which eliminates the cable clutter. Safer: No AC power is involved, as you don’t need to install A/C power outlet for the end-devices. Easy Maintenance: You can restart the end-device remotely. No need to press the power button to reset the equipment. You can easily move the end-devices wherever you can lay a LAN cable. 4. Sample List of Equipments that uses PoE. PowerOverEthernet.com site maintains a Huge List of all PoE products, including a PoE Analog Clocks and PoE Gas Detector. If you are working on kernel development, or device drivers, or running a code that could cause kernel panic, SysRq key will be very valuable. The magic SysRq key is a key combination in the Linux kernel which allows the user to perform various low level commands regardless of the system’s state. It is often used to recover from freezes, or to reboot a computer without corrupting the filesystem. The key combination consists ofAlt+SysRq+commandkey. In many systems the SysRq key is the printscreen key. First, you need to enable the SysRq key, as shown below. Following are the command keys available for Alt+SysRq+commandkey. ‘k’ – Kills all the process running on the current virtual console. ‘s’ – This will attempt to sync all the mounted file system. ‘b’ – Immediately reboot the system, without unmounting partitions or syncing. ‘e’ – Sends SIGTERM to all process except init. ‘m’ – Output current memory information to the console. ‘r’ – Switch the keyboard from raw mode (the mode used by programs such as X11), to XLATE mode. ‘s’ – sync all mounted file system. ‘t’ – Output a list of current tasks and their information to the console. ‘u’ – Remount all mounted filesystems in readonly mode. ‘o’ – Shutdown the system immediately. ‘p’ – Print the current registers and flags to the console. ’0-9′ – Sets the console log level, controlling which kernel messages will be printed to your console. ‘f’ – Will call oom_kill to kill process which takes more memory. ‘h’ – Used to display the help. But any other keys than the above listed will print help. We can also do this by echoing the keys to the /proc/sysrq-trigger file. For example, to re-boot a system you can perform the following. To perform a safe reboot of a Linux computer which hangs up, do the following. This will avoid the fsck during the next re-booting. i.e Press Alt+SysRq+letter highlighted below. Tripwire is a host based Intrusion detection system for Linux. Tripwire monitors Linux system to detect and report any unauthorized changes to the files and directories. Once a baseline is created, tripwire monitors and detects, which file is added, which file is changed, what is changed, who changed it, and when it was changed. If the changes are legitimate, you can update the tripwire database to accept these changes. This step by step instruction guide explains how to install and configure open source version of tripwire. Download the latest tripwire open source version from tripwire sourceforget project website. Extract the tripwire source code to the /usr/src directory as shown below. Use the prefix option as shown below to specify the installation directory. In this example, I’ve installed tripwire under /opt/tripwire. During make install, it will prompt you for various user inputs, that are highlighted in red below. agreement to continue installing Tripwire. Press ENTER to view the License Agreement. Generating key (this may take several minutes)...Key generation complete. even for a single instance tripwire. Local passphrase will protect tripwire database and report files. For the first time use, you should initialize the tripwire database as shown below. The object: "/sys" is on a different file system...ignoring. ### Warning: File system error. The database was successfully generated. As shown above, during the tripwire database initialization, it may display “No such file or directory” error message for some of the default files mentioned in the tripwire policy file. If your system don’t have those files, edit the policy file and comment those entries. For example, modify the /opt/tripwire/etc/twpol.txt tripwire policy file and comment out /cdrom and /floppy as shown below. Using the tripwire policy files you can define the directories and files that needs to be monitored for the changes. You can also be more granular and specify the file attributes that should be either monitored or ignored. Following are some of the UNIX system properties that are monitored by tripwire. Once you’ve modified the policy file, it needs to be updated as shown below. ======== Policy Update: Processing section Unix File System. ======== Step 1: Gathering information for the new policy. ======== Step 2: Updating the database with new objects. ======== Step 3: Pruning unneeded objects from the database. Note: if any files has been modified from the time you’ve done the tripwire initialization until the tripwire update policy, they will be listed under the “Step 1: Gathering information for the new policy” output of the above command. ### Warning: Policy Update Changed Object. ### An object has been changed since the database was last updated. 6. Check for any changes to the files and update tripwire database. Once the tripwire setup is completed, you should regularly perform checks to find out what files where added or modified from the last time the tripwire database was updated. You can perform this check interactively from command line as shown below. This will automatically open the following tripwire report file in the vi, where you can review all the files that has been added or modified to the system. As shown below, the “Added” and “Modified” files will have a check mark in front of them, indicating that you are accepting these changes to be updated to the tripwire database. with the new values for this object. 7. How to view the twr report file? All the tripwire report files with *.twr extension are stored under /opt/tripwire/lib/tripwire/report directory. tripwire report file *.twr is not a text file, which you can view directly. In order to view the report, use twprint and convert the *.twr file to a readable text format as shown below. Add tripwire checking as a cron job to monitor and report any changes on an on-going basis. For example, add the following line to your crontab to execute tripwire check daily at 4:00 a.m.
Use twadmin to view the current tripwire policy files. Only partial output is shown below. Use twadmin to get information about all the tripwire configuration files as shown below.